The Babakotia was a medium-sized genus of lemur that is currently extinct. It was originally from Madagascar, and its genus only contained one species – the Babakotia radofilai. 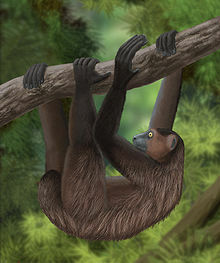 Together with some other animals that are now extinct, they formed the Palaeopropithecidae family which are more commonly known as sloth lemurs. The name of this animal is derived from the Malagasy name for the Indri, babakoto. All sloth lemurs are closely related. It has a mix of morphological traits that shows the intermediate stages between the large sloth lemurs and the currently living indriids. Babakotia radofilai’s have many traits with living sloths. This is an excellent demonstration of convergent evolution. It had long forearms, curved digits, a mobile hip, and mobile ankle joints. 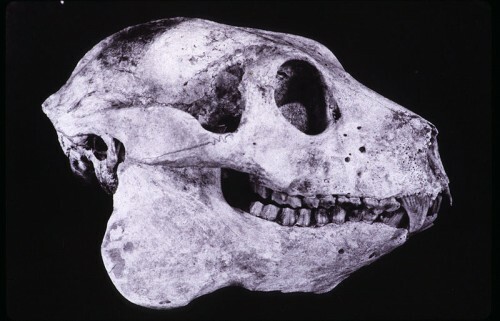 Its skull is heavier than those of the indriids, but not as large as the other then living sloth lemurs. Its range was northern Madagascar. It shared this range with at least 2 other sloth lemur species, the Mesopropithecus dolichobrachion and the Palaeopropithecus ingens. For food, it ate leaves most of the time, and therefore is called a folivore. However, it is also thought to have eaten hard seeds and fruits. This animal is only known from subfossil remains. It has thought that it may have died out shortly after humans arrived on Madagascar. However, not enough radiocarbon dating has been done to prove this theory. The first subfossil remain was found in the early 1980’s by Elwyn Simmons, a biological anthropologist. These fossils were unearthed in 1988, at a cave known as the Antsiroandoha in Ankarana Massif, northern Madagascar. A nearly complete skeleton and skull were found, as well as remains of about 12 other individuals. As it only died relatively recently and is only known through its subfossil remains, it is considered to be a modern day form of the Malagasy lemur. However, we do know that the Babakotia radofilai did live during the Holocene epoch and may have disappeared after humans arrived to the island, which was within the last 1000 years. However, the only radiocarbon dating done reports that the fossils actually date back to 3100-2800 BC.